How many truck owners do you know that have owned their vintage GM pickup almost 40 years! Steve and Patty Briand of Woburn, Massachusetts have been the owners of a vintage GMC since 1978 and it has become part of their family. This 1949 GMC ½ ton long bed was bought new by the owner of a large chicken farm in Manchester, New Hampshire. Therefore, a ½ ton was adequate but the longer 8 foot bed (not the normal 6 foot on a ½ ton) could haul more of their lighter weight products. After about 25 years, it was sold to an individual in Massachusetts as his daily driver. He did the usual repairs and upgrades that normally occurs to a well-used truck of this age. Just 4 years later it was for sale again. The owner had accepted a job transfer on the west coast. As the GMC still required some mechanical repairs, the owner would not drive it the 4,000 miles to his new home. The cost of hiring a transportation company was not an option. When the Briand’s saw this GMC, born in 1949, advertised at $450.00 and they found this was a running truck it was “love at first sight.” For this price it could even be used for their miscellaneous hauling needs. Their landlord at that time had an available garage to protect it from the heavy seasonal snow. Otherwise, Steve began using it occasionally to drive to his local job. People in his company always knew Steve was on the job as the GMC was taller than the other vehicles in the parking lot! The first big project was making it all one color instead of several colors and primers that showed its many years. Steve and Patty chose an original GMC cream. It made such a visual improvement. This color remained for almost 35 years. Over the many years, the Briand’s long term goal was someday to make their GMC just like it came from the dealership in 1949. They knew this would be a major time consuming project and a big money spending project. So for about 35 years it was a driver, the restoration would wait until retirement years! When they bought their “dream home” in 1989 the GMC was part of the equation. Their pickup must have its own private house, when restored so they built it behind their home in 2014. The “GMC’s house” has more than parking space. An area at the side gives storage for most of the disassembling that was to occur. Even the roof supports were given extra strength for a winch, for someday lifting the cab and engine with transmission. No major changes (other than color) were done over the years. It was a matter of keeping it running much like in 1949, with parts hunting and discovering other owners, Steve managed to usually keep it going. One great help was discovering and joining the North-East Chevy/GMC Truck Club. Their membership base is in Massachusetts and the surrounding states. It is now considered the oldest running vintage truck club in existence. Club contact is: gordonmil@msn.com Steve could always call on a member for emergency parts and repair advice. After Steve’s retirement the time was right. The disassembly began in early 2016. One year was set aside for this to be Steve’s only activity. SURPRISE! The restoration has just been completed after 2 ½ years! So many unexpected extras occurs during a restoration of this size. Steve, at times, became overwhelmed. 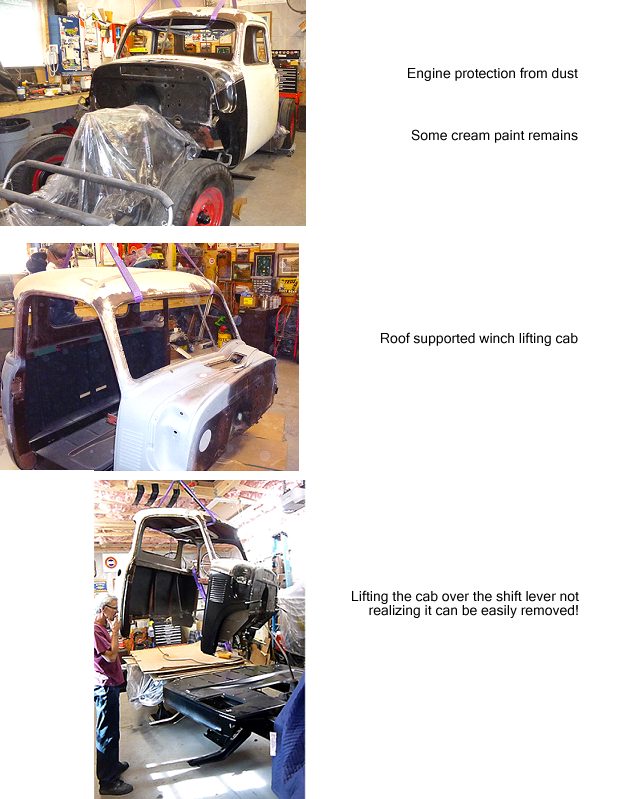 It is one big project to disassemble a 65 year old truck with rusty bolts from New England winters, a totally different set of rules exist for a quality restoration and assembly. Steve began the long difficult job of the total restoration (he had never been involved in a project like this.) Though he enjoyed it, in a few months he realized there were so many different things to learn that were totally new to him. What now? A different approach would be necessary if it was to be completed in his lifetime. Sometimes it is who we know that helps solve problems that may seem overwhelming. This speaks for Steve Briand and his GMC. One of his good friends had knowledge of a local shop owner that specializes in major special interest car restorations. In his many years restoring, the owner had never rebuilt a truck and was really interested in this GMC. Good luck for the Briand’s. 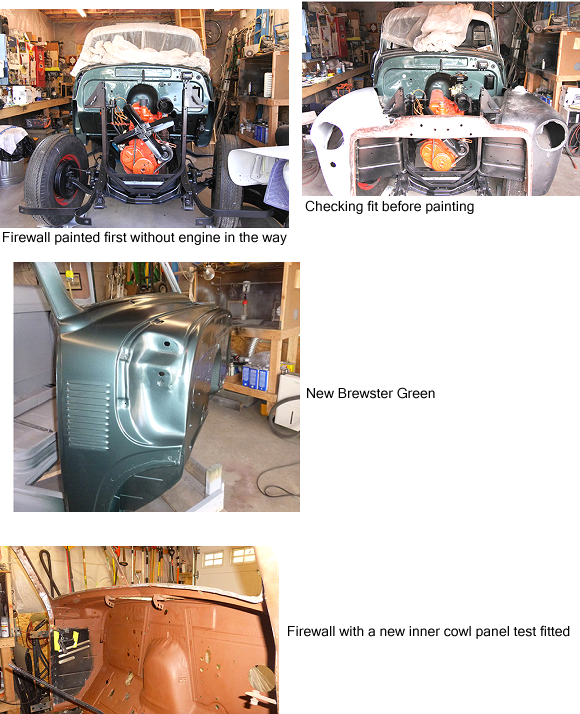 Steve had the pickup totally disassembled and parts completely covered their garage floor! To learn about a GMC, and not haul the many parts to his local shop. (Steve knew how it went together) the restoration shop owner offered to bring his tools to their garage and work on the weekends. Wow! Someone must have been watching over the Briand’s. This match was certainly made in heaven! The part time weekend project continued almost 2 ½ years. Both added to the restoration. To prevent a possible unhappy neighbor in their residential neighborhood the Briand’s invited them over to share the progress of the restoration. As the Briand’s were already very close with those nearby residents all liked watching the progress in his garage. Most had no idea what takes place in a ground up building. 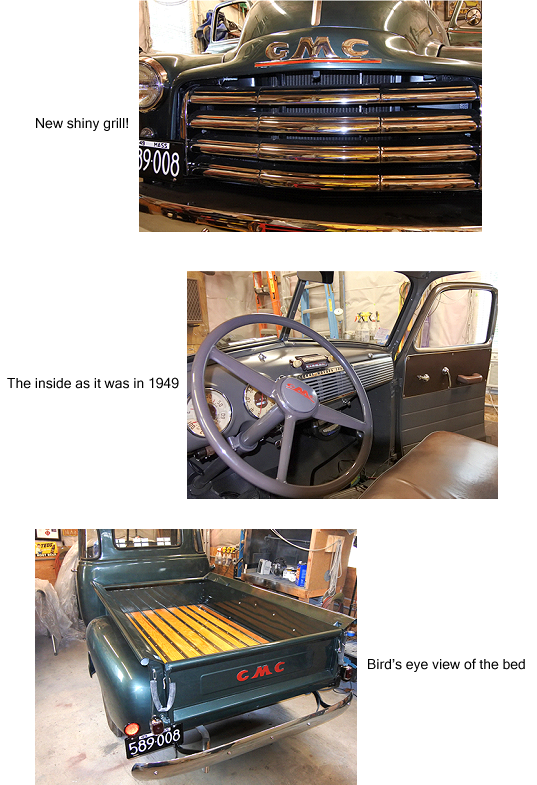 Yes, sometimes a complicated item was taken to the restoration shop but most work was done in the GMC’s personal house! The Briand’s have kept their GMC with its original 228 inline six cylinder engine and 6 volt electrical system. The 4 speed top loader transmission is almost bullet-proof in a GMC ½ ton. It was standard equipment in the in the large 2 ton GMC work truck! What is unusual it is an 8 foot bed and 125” wheel base like a ¾ ton but is still rated as a ½ ton. The rear leaf springs are ½ ton 1 ¾’’ wide, not 2’ as in a ¾ ton! The smaller ½ ton differential has a ratio of 4.11 and not of the lower gear slower moving 5.14 or 4.57 on ¾ tons. When removing the hood hinges from the firewall during the complete disassembly, they found the untouched original Brewster Green. This is now its new correct color! 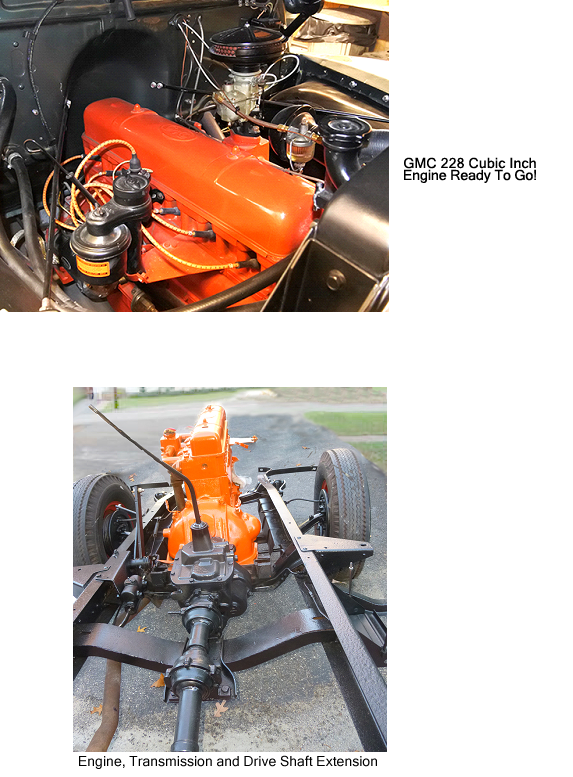 It has also the orange engine color that replaced olive green in 1948. Steve and Patty Briand now have their new 1949 GMC. It is kept in its own personal home and will not be on the road during snow days. Now only an occasional light weight hauling job might be allowed. Very important for the six volt electrical system, this GMC has the correct heavy gauge battery cable to the starter plus two ground cables. Just like General Motors did on all their 6 volt vehicles. Thus, the engine turns over almost as fast as a newer 12 volt vehicle. The Briand’s give fair warning to a thief with an idea of breaking into the GMC’s garage to steal expensive tools. 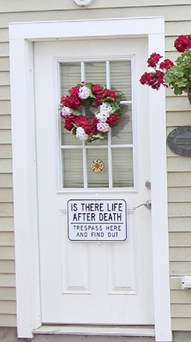 Check out their sign posted on the door! Another Steve Briand’s sideline. 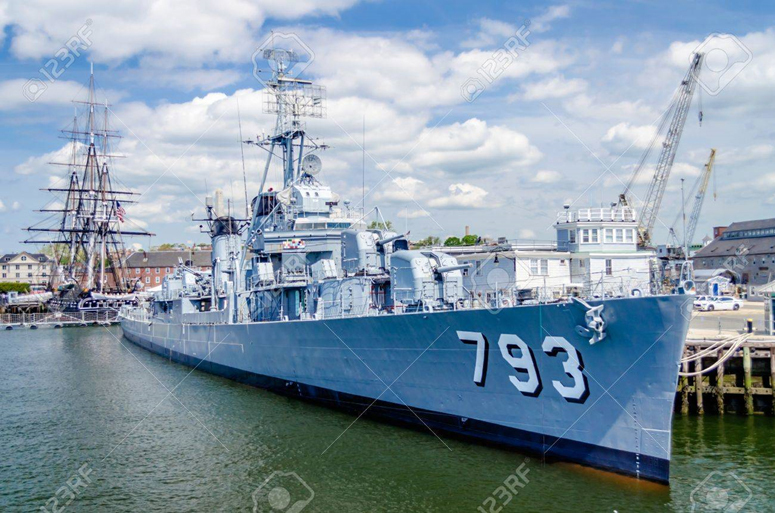 For 35 years he had been helping 30 military veterans in the restoration and upkeep of a WWII destroyer, the U.S.S Cassin Young now kept in a dry dock in Boston. All is volunteer work and they have brought it back to its appearance 75 years ago in the Pacific. Rear of truck. Notice the rare GM accessory reflector! The Red Wheels Sure Make the Truck Stand Out! If you would like getting into more details regarding this GMC ½ ton long bed read on! From 1936 through 1955 a 8’ long bed on a GMC ½ ton was a factory option. (The more normal ½ ton bed is 6’) Our feature truck included the usual 16’’ 6 bolt wheels, longer frame side rails, an extra cross sill, and the same bed used on the GMC and Chevy ¾ ton pickups. This long bed ½ ton was not offered on Chevrolet pickups. For this GMC option General Motors cost was not that expensive until it came to the need for a longer drive shaft behind the transmission. What do they do now? No doubt this is where real engineering talents become necessary. This would require about a 2 foot connection for the extra bed length, between the u-joint and the short bed driveshaft used on their 6 foot bed. 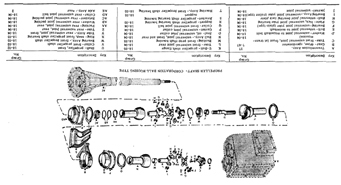 GMC engineers suspected there would be some major problems if they just lengthened the ½ ton drive shaft assembly. Too much length to withstand overload abuse by some owners and repairs might be a big expense to them. It would probably be the last GMC the mad owners would ever have if the problem developed. The decision was to continue with the proven short ½ ton closed drive shaft but create an almost 2 foot insert with and extra u-joint. If and when this extension failed it would be much easier to repair. Some have called it GMC’s “weak link” but they were built heavy and withstood many, many years of abuse. After all it was a ½ ton, not a big work truck using this extension See photos and the enclosed blue print from a GMC shop manual. 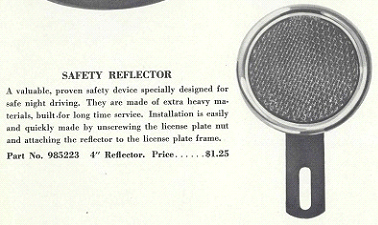 To add better night visibility to all trucks, Suburban’s and panel trucks, General Motors offered a 4 inch diameter reflector as a dealer installed accessory. With the single small factory taillight, seeing of these vehicles on the road could be difficult especially if their one bulb burned out. To help correct this problem GM offered a larger reflector that could be attached to the rear license plate bracket. It greatly improved visibility to others at the rear during night driving. This was a time when town street lights were limited. Of course, on the open road there was no lighting along the highways! This simple GM reflector was offered by the dealers to prevent rear end accidents. The customer could buy this dealer accessory from about 1940 through 1953. One of the attached photos is taken from a 1949 Chevrolet Truck Data Book. The 4 inch lens is a Stimsonite # 24 and the metal Guide ring has a stamping of X-19. Jim Winters of Rochester, Minnesota has both a restored 1946 panel truck and ½ ton pickup with this option. This entry was posted on Wednesday, August 1st, 2018 at 12:03 pm	and is filed under Featured Trucks [unsorted]. You can follow any responses to this entry through the RSS 2.0 feed. Both comments and pings are currently closed.